I wasted three years of my life attending networking events, collecting business cards, chasing people who wouldn't return my calls, and thinking that business networking was one big waste of time. It took me years to learn that my Elevator Pitch was all wrong and that my approach to networking events was backwards. Your Elevator Pitch isn't about you! And it's about starting conversations with people who are like or who know people who are like your best clients. Clear and concise answer to "What do you do"
So that's what we do first! We get on a one hour call. For the first 30 minutes I ask you six questions. They're easy and fun to answer, and they help me get to know you and the kind of work you do. Then in the next 30 minutes you peer over my shoulder as I write your 30-Second Elevator Pitch and Answer to "What do you do." I do the writing. You make sure it's fun to say, easy to memorize, and most importantly: sounds like you! I thought I was attending networking events to look for prospects. Except... that's prospecting. Not networking! You network with non prospects. Over 30 days I show you how. You get unlimited 30-minute phone calls with me. We do a Business Networking Assessment to make sure you're choosing the right events and following up effectively. I'll share practical strategies you can use immediately to discover the hidden opportunities in your network (even if you don't think you know that many people). And we'll work on setting up networking meetings. What are those? Exactly. 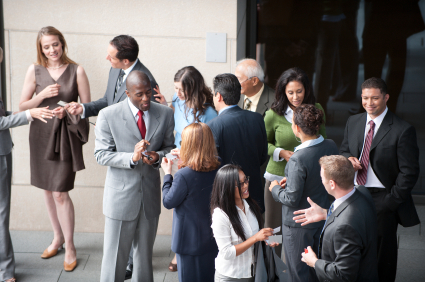 This is the best kept secret in all of networking. The work of networking happens outside the networking events, in coffee meetings. I'll help you pick the right people for follow up, and I have word-for-word scripts you use to set up the meetings and start the conversation.